After looking through the first section on writing Informational texts, I knew this book would be perfect for our new IB unit on jobs, responsibilities, and community helpers. The children have been working hard this week to write about a community helper that they have chosen. 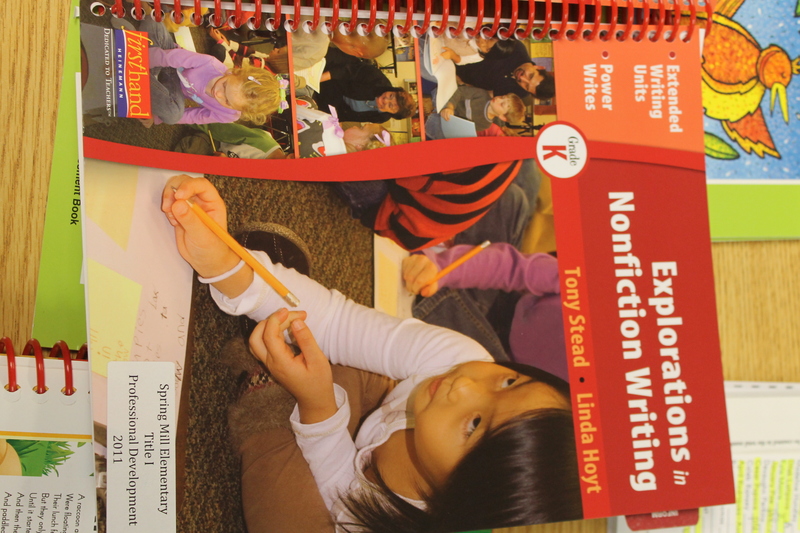 We began by talking about ways that we can find information about topics we would like to write about. 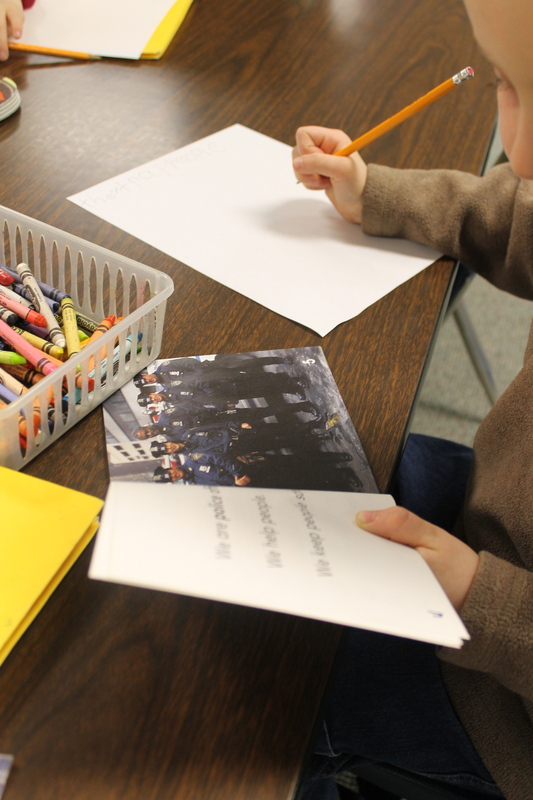 Next, we moved on to writing down facts we thought we knew about our topic/community helper (we used firefighters as a whole class example) and learning about how to confirm those thoughts by using research materials (namely books). We’ve spent the last two days looking in books to confirm facts we think we know and will continue to do that the rest of this week. Here are the children hard at work, selecting appropriate research materials and writing down some new facts about their community helper. 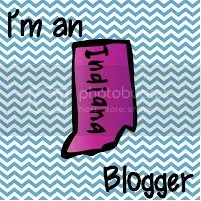 As we work through this unit of writing, I’ll keep you posted on our progress. 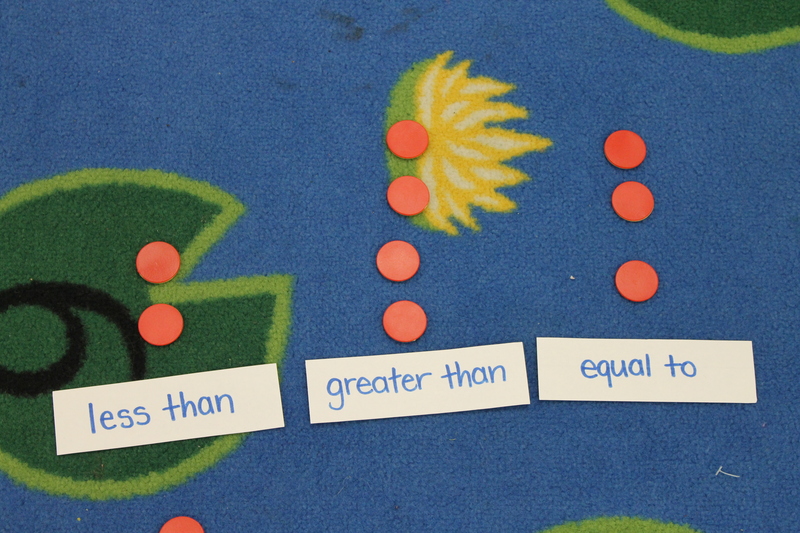 This game was taken from an idea that was on the K-5 Math Teaching Resources page. 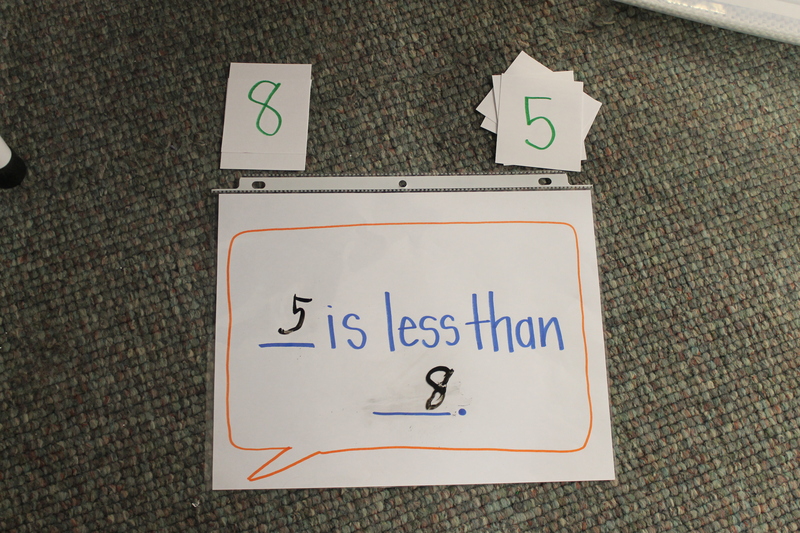 I modified it into a “Math talk” sentence (as suggested by Debbie Diller) for my Math Work Stations. The two children working at this station each pick a card from their pile. They turn it over and decide which number is less than the other and write those numbers in the appropriate blanks. The “Math talk” page is inside a sheet protector (as are most of my math sheets so they can be reused). 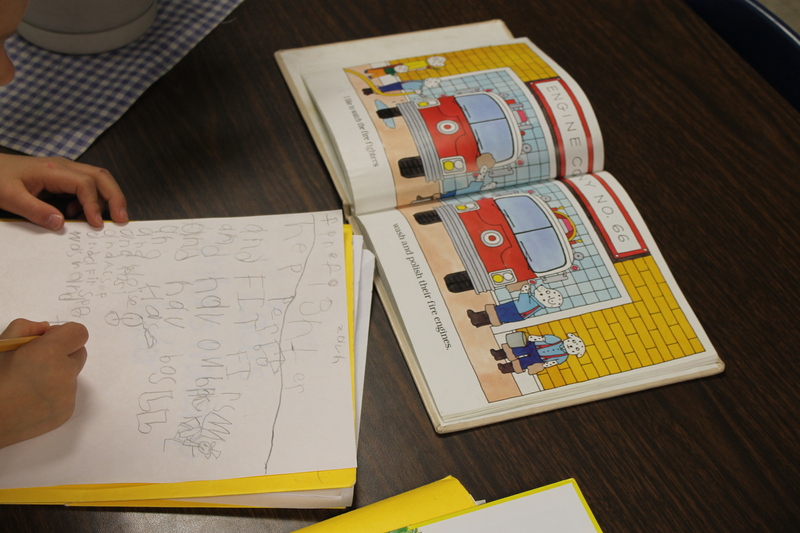 The children write their answers with a dry-erase marker and erase with an old sock. This game is also from the site mentioned above. The children roll a die (1-6) or you can have them roll 2 dice if you would like them to practice larger numbers. They then need to make a pile of chips that is less than that number, equal to that number, and a pile that is greater than that number. This is an activity box that I got from Lakeshore. There are 3 activity cards that come in this box and I’ve just put this card out so that the children can explore the 3D shapes before we talk about faces, edges, and vertices later this month. The children predict what they think each shape will do before letting it move down the ramp, by making a check in one of the first two columns. They then experiment with the 3D shapes and find out how the shapes actually get down the ramp. The other two cards ask the children to identify the number of faces, edges, and vertices that each 3D shape has (those cards will be out in the next month). 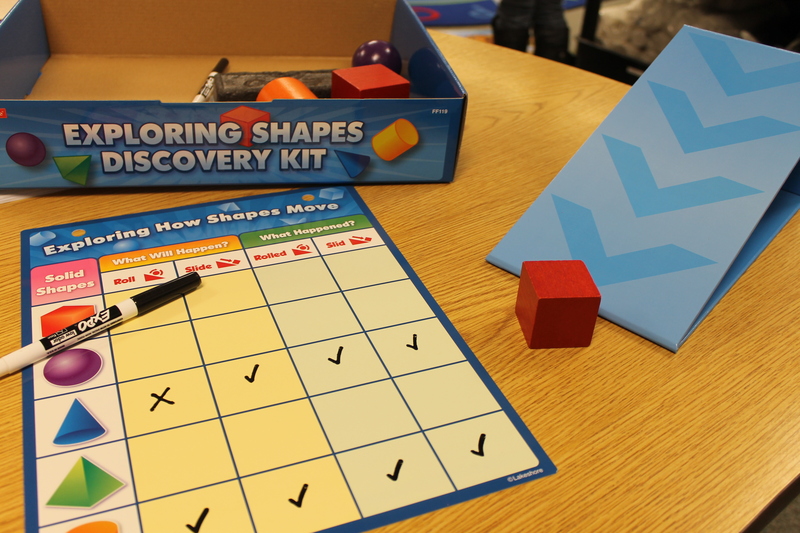 This kit is nice because it comes with 3 sizes of each of the shapes (small, medium, and large), so that I could make three different Math Work Stations from this one kit (now that I’ve typed that, I think I will! 🙂 ). 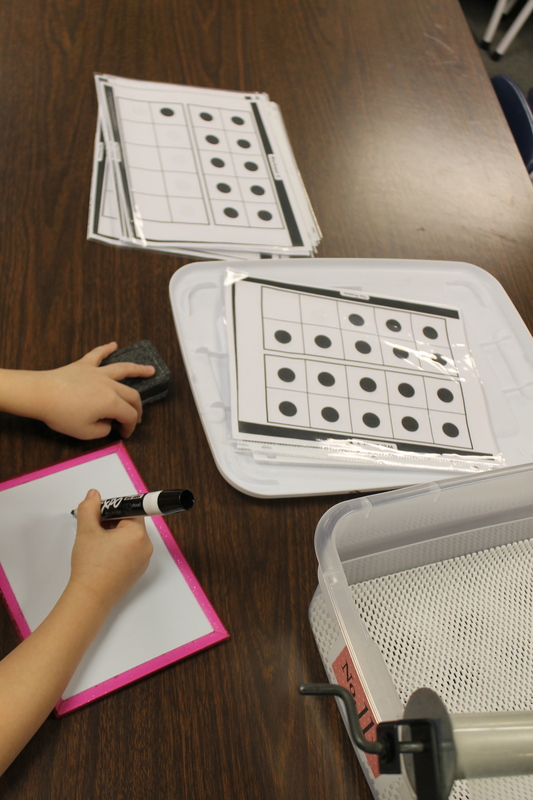 In this partner game (also inspired by K-5 Math Teaching Resources), the children learn about quickly reading a ten frame. One partner shows a ten frame and the other student writes the number they thought they quickly saw on that ten frame on the dry erase board. This game is directly from K-5 Math Teaching Resources. It’s called Shake 5 and Spill. If you are familiar with Shake the Beans (I’ve posted on that before), this is very similar. The children have 5 counters in a cup and they shake them up. 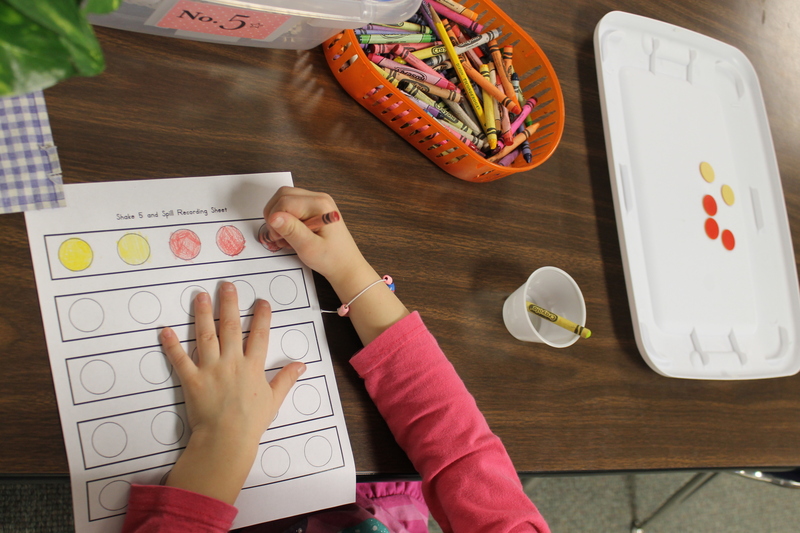 They then spill them out and using the recording sheet (provided on the K-5 Math site), record their way to make 5. You can see in the picture that we are using red and yellow crayons to help represent the colored sides of the counters.